I love pizza – any kind of pizza. Traditional Italian style, Chicago deep dish, New York, Californian, and even those bagel pizzas. To me, every type of pizza has its charm. Sure, there are days where I feel like one type of pizza more than another, but in the end, I can’t say that I dislike any of them. To me, the key of making pizza is the dough – generally this is what differentiates one pizza from the next. Pizza Hut’s pan pizzas are particularly appealing to me as they have a crisp exterior and spongy interior. When I saw this recipe to recreate the pan pizza at home, I had to give it a try. I have been making bread for thirty years. Some years ago I started mixing and kneading the bread in the mixer. There was a great discovery. Kneading by hand tended to make me lazy and quit early. Now I finish up with a little hand kneading to get the right texture. My next great discovery was to remember that someone had given me an electric warming plate and it was the perfect device for preparing the environment for the dough to rise. It is too easy to cook your dough with a too hot oven when you mean to let your dough rise. 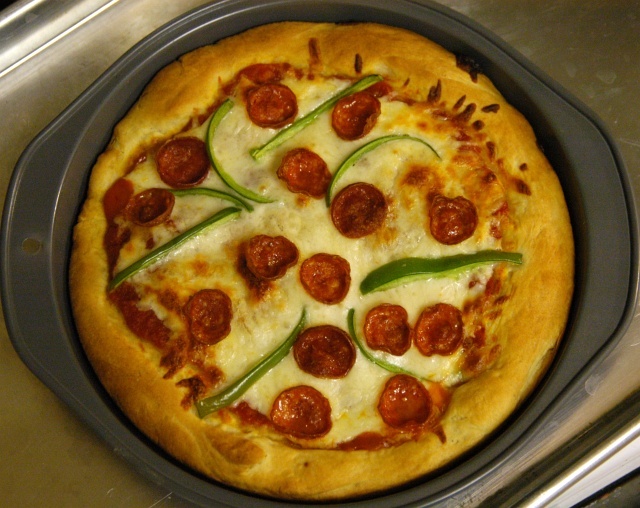 About ten years ago I experimented with using bread dough for pizza. It was fun. It was a lot of fun when I involved children. They love to be involved in making their own pizza. I will probably try this recipe for kicks. It looks fun and delicious!